Antebellum Bourbon was Little Aged? Not. An article of August 1, 1886 appeared in The Sun in New York entitled “Bourbon and Rye”. The writer, uncredited, billed himself as an expert in the field and the article shows every sign he was, for example his deft explanation how the temporary exporting of whiskey could reduce the cost of maturing it. What I find most interesting, apart from the (already) looming shadow of Prohibition, is the description of Bourbon character before the whiskey tax. It was newly levied in 1862 to pay for the Civil War, and sharply increased by the end of the war. For convenience though I’ll speak of Bourbon before and after the war. Then the theory was that Bourbon never reached its rich maturity “until half the contents of the barrel had evaporated”. Nothing short of six-year-old bourbon was accounted fit for use, and many a hospitable Kentucky mansion contained in its cellar mellow and aromatic Bourbon of from ten to twenty years old. Although the author doesn’t mention it, commercial producers such as Oscar Pepper also aged their product for a reasonable time. Oscar Pepper’s product, made by the legendary Scots-born physician James Crow, was noted for its red colour and must have been seven years old at a minimum. As early as 1818 some Kentucky whiskey was advertised as seven years of age and some was available at higher ages. Still, some bourbon historians state that most Bourbon before the Civil War was young, a year or two at most. Gerald Carson appears to hold this view in his landmark The Social History Of Bourbon (1963). The Sun explains that aging liquor was no great burden before the war or even after the tax started, when it was low. Annual shrinkage, the angel’s share to which all aging spirits are subject, added to the whiskey’s cost as the tax had to be paid on new spirit and the producer was not credited for shrinkage. Still, early on the extra cost was considered acceptable. When the tax rose however to $2.00/gal. it became uneconomic to age whiskey as long as before. The writer was a little inaccurate on his recollection of the tax rates, this U.S. government source gives the true picture, but there is no reason to question his general argument. The result of the Civil War tax was Bourbon became much younger than people were accustomed to earlier, two or three years old, half the minimum age considered acceptable before the war. This created an opportunity for blenders, who added a few gallons of expensive old whiskey to a much larger amount of neutral spirits to create an acceptable drink. Indeed, blending manuals start to appear about 1860 although the commercial practice probably started earlier, as it did in Britain. This blending is the origin of modern American blended whisky, taking in brands such as Seagram Seven Crown, and indirectly of Canadian blended whisky. By 1886 the increase in the bonding period, during which whiskey could be stored tax deferred, and new rules that relieved distillers from paying tax on the angel’s share, made it economic to keep whiskey for longer if not 10 and 20 years. When these stocks were supplemented by American whiskey brought home from a seven-years sojourn in Bremen or Liverpool, that created a market where bourbon and rye could be offered at seven years vs. the four year average then prevailing. It’s interesting that again today, four years is the norm for straight whiskey. Jim Beam White, Four Roses Yellow Label, Maker’s Mark, or Jack Daniel’s, say, are that age more or less, even (we think) in an era when a sharp spike in bourbon sales has long evaporated the “whiskey glut” of 15 and 30 years ago. 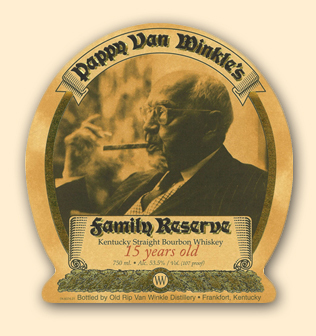 There is a tendency in Bourbon country to consider Bourbon over-aged at more than eight or 10 years. Charlie Thomasson, in a c.1960 article on old-fashioned distilling at Willett’s Distillery in Bardstown, KY (now in operation again) wrote that the best Bourbon was about six years of age. Yet The Sun in 1886 explained that grandees prized Bourbon aged two to three times longer before the Civil War. Thomasson felt that prolonged aging would impart a “punky” taste to the liquor, a degraded flavour from a deterioration of the barrel staves, yet old Kentucky must have liked that taste. Despite Gerald Carson’s view, there is good reason historically in my view to consider that “Bourbon” – vs. of course “common whiskey” always meant an aged drink, one that a acquired a brown or red colour in aging and a sweet taste from caramelized wood sugars. In contrast, common whiskey including corn whiskey, was un-aged or little-aged until the Civil War. Of course, terminology was never precise. 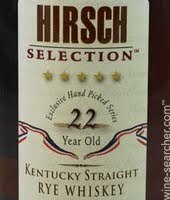 “Old whiskey” could mean Bourbon (or straight rye), and I am sure examples can be cited of Bourbon advertised at two or three years. But in general, Bourbon, or the quality end of it, meant a well-aged drink with a rich palate, comparable to fine French brandy, say. The Sun’s account supports that. Speaking of brandy: I don’t believe Bourbon emerged to compete with Cognac or acquired its name from a connection to New Orleans or French influence there. But there is no question Bourbon was considered an alternative to Cognac as a quality spirit. The availability of old brandy by the mid-1800s perhaps inspired longer aging by Bourbon distillers. A similar influence was probably at play too from the Scottish Highlands where the lairds liked to keep a vatting of old malts in the cellar. There was old rum as well in the international market: all these trends worked together and probably influenced each other. But the suggestion that Bourbon was a synonym for Cognac to my mind doesn’t wash and the evidence seems rather thin, it is more inferential. The takeaway: fine Bourbon was expected to be long-aged before the war. Perhaps due to its extra-congeneric character – much of it single distilled in pot stills or crude column stills – those extra years were needed. I’d lay odds the average bourbon or rye mash of a modern distillery is much cleaner, hence needs much less time in wood. At day’s end, I like 6-8 years in wood, rarely more: Thomasson had it right (he was a teetotaller, by the way). Note re images: the labels shown above were sourced here and here. Both are believed available for educational or historical use, all feedback welcomed. All trademarks shown belong exclusively to their owners or authorized licensees.